Mahindra Navistar recently started its first on ground forum to meet the fleet owners and other important members of the truck industry. The main motto of Mahindra Navistar – Out Performance league is to connect with the members of trucking industry and resolve the issues that the industry is facing at this moment. 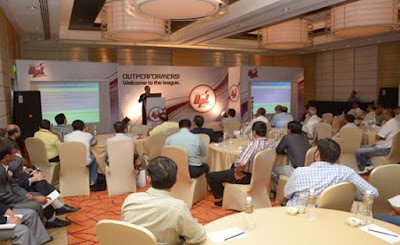 Lately, Out Performance League forum was conducted in Ahmedabad, Gujarat where Mahindra Navistar and important members of the trucking industry discussed the various key points which are necessary for the improvement of trucking industry in our country. Nearly 60 top transporters attended the event at the Marriott in Ahmedabad. So what does “Out Performance League” mean? The Out Performance League is an open discussion forum which targets all the members of the trucking industry which includes fleet owners, investors, suppliers and also truck drivers. The modest perception of the league is to discuss the problems prevailing in the trucking industry in our country and debate on solutions and resolutions to raise the bar of the industry. New Trends in the Trucking Industry: New trends and developments are conversed for positive development of the industry. Suppliers and fleet owners discuss new methods & their implementations for advancement of the commerce. Expert Advice: Experts from the trucking industry with valuable trucking experience share their knowledge with the forum to resolve issues and problems faced by fleet owners & truck drivers. Moreover, glitches are identified & discussed to avoid future problems. Mahindra Navistar has introduced first of its kind forum to set a benchmark in the Indian trucking industry.